FOXBOROUGH, Mass. 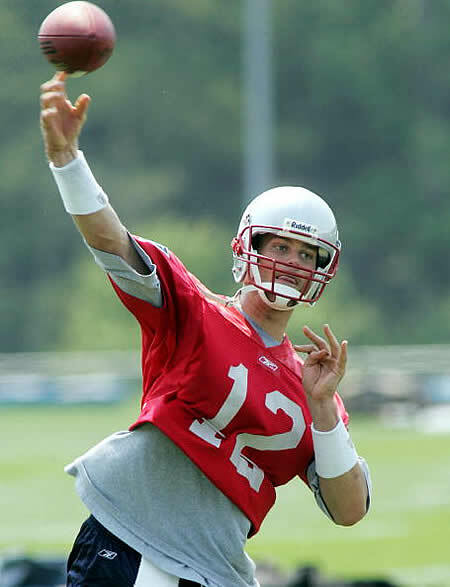 (AP) – Tom Brady is back practicing with the New England Patriots. The quarterback who was sidelined almost all last season with a knee injury was on the field Tuesday with most of his teammates. The Patriots are holding four days of organized activities this week. The first three days were held last week for young players and for free agents who signed in the offseason and need more time to adjust to the playbook. About 50 players, roughly half the team, took part in the voluntary sessions. This guy must be raring to go after missing the whole season last year if he’s coming off a busted knee and coming to optional practices where only half the guys show up. This does not bode well for the Pats opponents. Plus, there is a rumor that Gisele is knocked up. Needless to say, he must be pumped about that too. I kinda feel bad for everyone in the NFL. Kinda. Brady said that playing 10 more seasons “is a big goal of mine, a very big goal. I want to play until I’m 41. And if I get to that point and still feel good, I’ll keep playing. I mean, what the hell else am I going to do? I don’t like anything else. Oh, you guys are so effed. 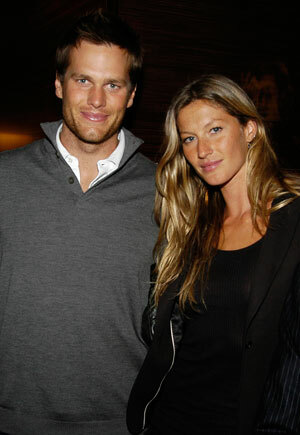 Rumor on the street is that Tom Brady and Gisele Bundchen tied the knot in Santa Monica yesterday. According to NBCSports.com, it was a small ceremony with friends and immediate family attending including Gisele’s three dogs and Tom’s son, all decked out in Dolce and Gabbana, including the dogs. The NFL better watch out this year, because it looks like Tommy Brades in on top of his game. And now that he’s locked up the highest paid supermodel in the world, he’s got nothing else to reach for except Superbowl titles. That’s called focus, my friends. You are currently browsing the archives for the Gisele category.